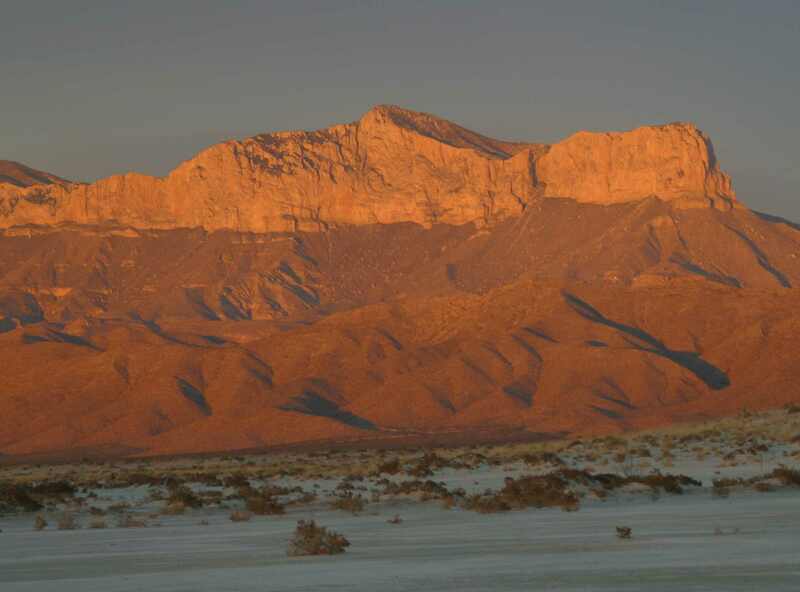 The May Meeting program will be a whirlwind tour of the surface geology of Texas, that is, the rocks exposed in each region and the land forms that result. From touring the varied regions of Texas, we will piece together the 1.2 billion years of earth’s history exposed in Texas. 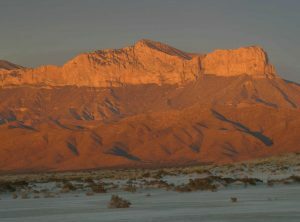 Photo of Guadalupe Peak, with the cliff El Capitan on the right. The scarp shows layers sloping to the right, which connect shallow reef limestones at the top to deeper marine shale at the bottom. Tom Dill was born in Nebraska, and grew up in the little town of Valentine, near the scenic sandhills and Niobrara River. He earned a BS degree in Geology from the University of Nebraska, and a MS degree in Geology from Oregon State University. For his master’s thesis Tom mapped volcanic and sedimentary rocks in central Oregon that came from the ancestral Cascade Mountain range. Tom has worked as a geologist in the oil and gas exploration industry for over 25 years landing in Dallas in 1997. He has been a member of the American Association of Petroleum Geologists since 1980, Geological Society of America since 1989, and Dallas Geological Society since 2001. A member of the Dallas Paleontological Society since 2005, he served as the Programs Chair since 2009, and is currently serving a second term as President. 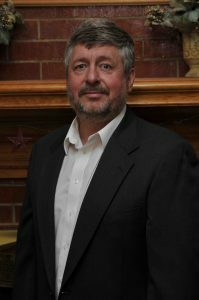 Tom has also taught Earth Science and Physical Geology courses at Collin and Richland Colleges, where he wrote and designed educational materials for an on-line Physical Geology course produced by the LeCroy Center of Dallas County Community College. For the former Elison Miles Geotechnology Institute at Brookhaven, he led field trips for teachers to the North Sulphur River just north of Greenville, Texas. Tom’s hobbies are hiking and backpacking, photography, kayaking and canoeing, and mineral and fossil collecting. He and his spouse Barb have four children.